ReutersPresident Barack Obama speaking in Las Vegas on Nov. 21, 2014. Barack Obama has said he quit his cigarette habit, but a report published in The Hill on Tuesday said “Piano Man” singer Billy Joel claimed the president offered him a smoke at the White House last year. However, a source close to Obama told Business Insider there’s no way that story is true. “This is ludicrous. 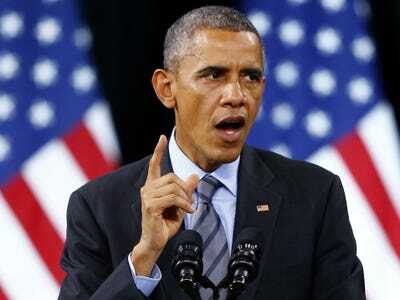 When it comes to his promise to kick the smoking habit, the President has been keeping the faith,” the source said. The Hill based their report on a person who said they saw Joel on Nov. 19 at the Jefferson Hotel in Washington, D.C. Joel was in the nation’s capitol to collect an award. While he was there, Joel also visited House Speaker John Boehner (R-Ohio) at his office. According to The Hill, while at the hotel, Joel described being offered a cigarette by Boehner, who is a smoker. Joel also allegedly said Obama once tried to smoke with him. “I was at the White House recently, and President Obama did the same thing. He said, ‘I’m going out on the North Portico to have a smoke. Do you want to come with me? '” Joel was quoted as saying. The Hill reported Joel responded that he had not smoked in a long time, but “ultimately couldn’t turn down a cigarette offer from the president.” Joel visited the White House in December 2013 after receiving Kennedy Center Honours. When he took office in 2009, Obama admitted he smoked occasionally. “Have I fallen off the wagon sometimes? Yes. Am I a daily smoker, a constant smoker? No,” the president said at a press conference that year. “I think that he didn’t want to look his girls in the eye and tell them that they shouldn’t do something that he was still doing,” she said. Last year, Obama was caught on an open microphone at the United Nations General Assembly discussing his smoking habit. “I haven’t had a cigarette in six years … that’s because I’m scared of my wife,” said Obama. A spokeswoman for the first lady declined to comment on The Hill story about the president allegedly offering cigarettes to Joel. Update (7:11 p.m.): Joel himself denied the story as well, according to a new report in the Daily News.